Amphibians are declining worldwide and land use change to agriculture is recognized as a leading cause. Argentina is undergoing an agriculturalization process with rapid changes in landscape structure. 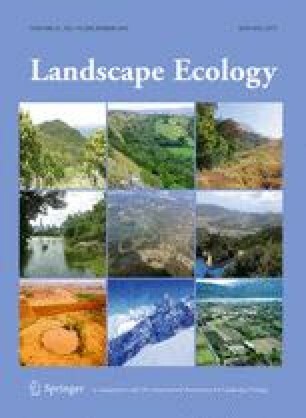 We evaluated anuran response to landscape composition and configuration in two landscapes of east-central Argentina with different degrees of agriculturalization. We identified sensitive species and evaluated landscape influence on communities and individual species at two spatial scales. We compared anuran richness, frequency of occurrence, and activity between landscapes using call surveys data from 120 sampling points from 2007 to 2009. We evaluated anuran responses to landscape structure variables estimated within 250 and 500-m radius buffers using canonical correspondence analysis and multimodel inference from a set of candidate models. Anuran richness was lower in the landscape with greater level of agriculturalization with reduced amount of forest cover and stream length. This pattern was driven by the lower occurrence and calling activity of seven out of the sixteen recorded species. Four species responded positively to the amount of forest cover and stream habitat. Three species responded positively to forest cohesion and negatively to rural housing. Two responded negatively to crop area and diversity of cover classes. Anurans within agricultural landscapes of east-central Argentina are responding to landscape structure. Responses varied depending on species and study scale. Life-history traits contribute to responses differences. Our study offers a better understanding of landscape effects on anurans and can be used for land management in other areas experiencing a similar agriculturalization process. The online version of this article (doi: 10.1007/s10980-016-0426-2) contains supplementary material, which is available to authorized users. This research was fully funded by INTA, through the Projects AERN 2624 and 2622. We thank to the numerous farmers that kindly granted access to their properties and Cerrito town by offering us a field station where to stay during field sampling periods. We also want to thank the valuable fieldwork assistance provided by P. Calieres and L. Castañaga as well as the advice and helpful comments provided by J. Thompson, M.J Pizarro, B. Poliserpi, Y. Sica, L. Solari, J. Decarre and A. Goijman from INTA, K. Hodara from University of Buenos Aires, D. Hocking and J. Veysey from the University of New Hampshire. We also thank Deahn Donner, Veronique St-Luis and an anonymous reviewer for valuable comments and suggestions in a previous version of the manuscript.